I’m thrilled to have my mother and my 4-year-old niece visiting me this week from New York. We’re having a great time catching up on magazines, tivo’d shows and of course, cooking. After she read my post the other day about hard boiled eggs, she said, “so I used to overcook my eggs?” I speak the truth on this blog and I asked my mother if she remembered the telltale green ring around her yolks. She remembered. 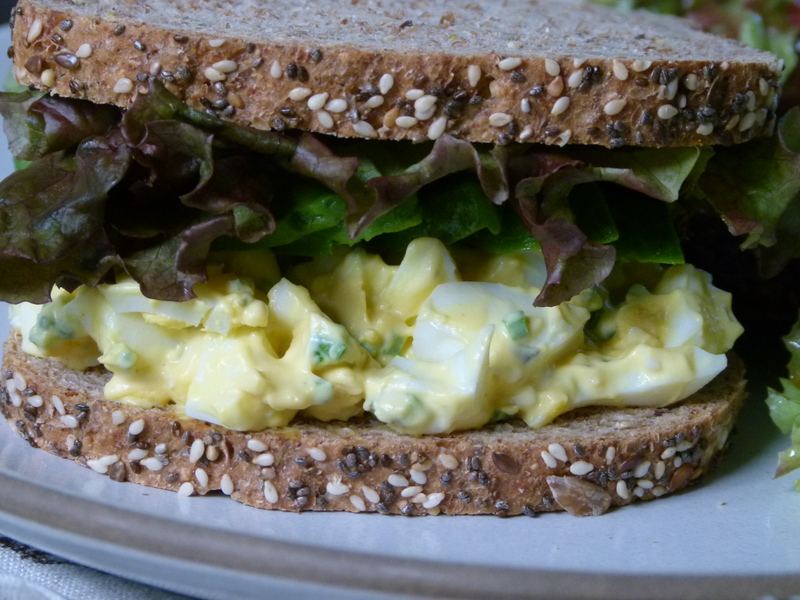 We reminisced about always eating egg salad sandwiches for lunch the day after Easter, and for old times’ sake I thought it would be fun to make them with my mom again. The two of us had a little egg salad cook-off with my mom making the version I grew up with, which is no more than chopped up hard boiled eggs combined with mayonnaise, relish and a pinch of salt. Always delicious and that little bit of sweetness from the relish makes this egg salad kid friendly, unless you’re Mr. Picky who thinks egg salad is one of the “scariest” foods out there. 2 plain hard boiled eggs for Mr. Picky, please! I whipped up my favorite version of egg salad which is loosely based on a recipe from my heroine, Alice Waters and her fabulous book, The Art of Simple Food. My more grown-up egg salad may taste more sophisticated than the old version, but I assure you it is just as simple, absolutely delicious, and still kid-friendly (for kids that would actually eat egg salad.) And look, Mom, no green ring! 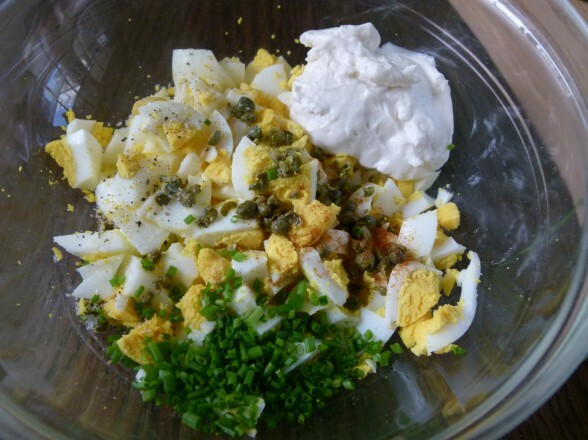 Hard boiled eggs are rather bland and the texture is soft, so I like balancing all that out with a little salty bite from some capers, some mild onion flavor from either fresh chives, shallots or green onions, and the smallest dash of cayenne for some kick. I don’t see how people can eat egg salad on squishy, bland white bread, and not just because white bread is tasteless and devoid of nutrients (maybe I should tell you how I really feel.) 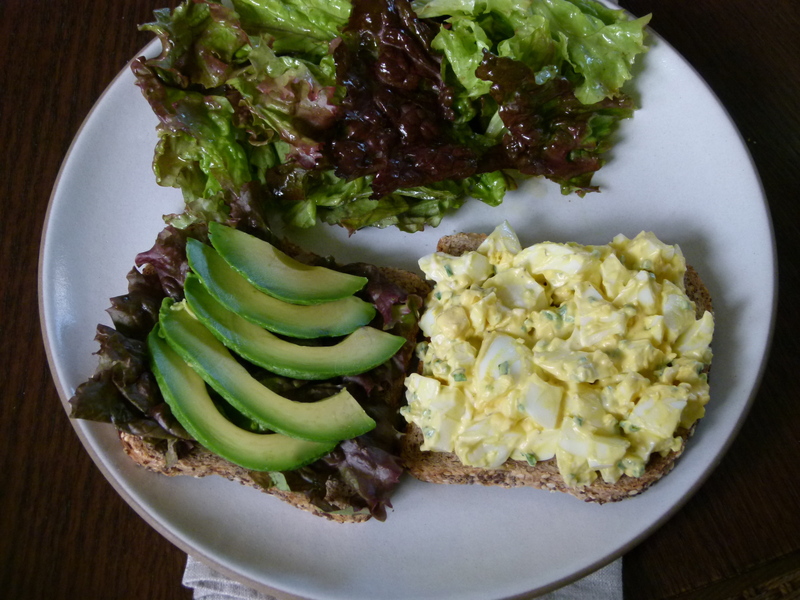 Egg salad just pairs so well with some texture and flavor, like from a nice hearty sprouted seed bread or other earthy, flavorful bread — always toasted. After enjoying this tasty sandwich with my mom the other day, I asked myself why I never make egg salad. It was such a simple and satisfying lunch with a side green salad. Daughter #1 gave the egg salad a try and became a convert, although with mouth half-full announced she liked it just fine, but wouldn’t be taking any egg salad too school for lunch — “I don’t want egg aroma in my backpack all day, thanks.” Whatever. Sliced on top of toast with smoked salmon or sliced avocado. Deviled eggs — I think this recipe for Caesar Salad Deviled Eggs at Smitten Kitchen looks interesting. Nicoise Salad — a composed salad of potatoes, green beans, tomatoes, tuna and hard boiled eggs. Cobb Salad — here’s a more healthful version by Ellie Krieger. In a filling for empanadas. I love my recipe which uses mixed greens, to which you can add a chopped hard boiled egg or two. Pan Bagnat — a sandwich with sliced hard boiled eggs, tuna, tomatoes, onions. Check out Alton Brown’s recipe here. Chopped over steamed or roasted asparagus. Then drizzle with one of my favorite everyday salad dressings. Do you have any great ways to eat hard boiled eggs? I’d love to know! Coarsely chop the eggs and place in a bowl. Add remaining ingredients and combine well. Taste for seasoning. Serve on toasted whole grain bread with greens like watercress or your favorite lettuce. I always love a little avocado, too! Mix everything to combine well. Pamela, Thanks for sharing this recipe. I used quail eggs for my recipe and it was awesome. I have never put capers in a recipe before today and I was pleasantly surprised. I have added this to my list of go-to in a pinch recipes. We just celebrated our Greek Easter this past Sunday and we have plenty of easter eggs left over, just tried your recipe, we truly enjoyed it! As greeks, we use capers quite often and I would never think to use it in a egg salad recipe. Thanks for sharing! 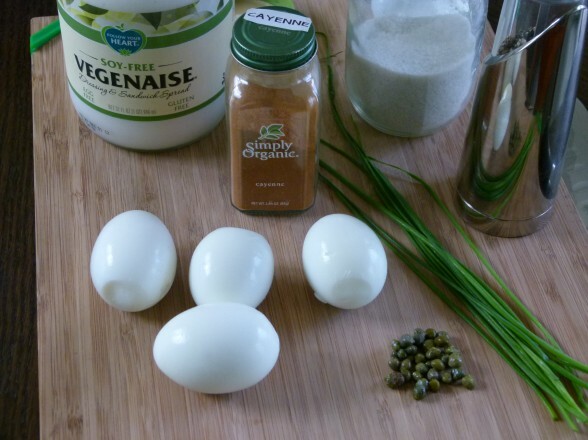 I’m trying your recipe for egg salad today but I was curious where you found the Vegenaise? I’ve tried Whole Foods and our local Natural Grocers but I can’t seem to find it. Also, I would just like to add I’ve made several of the recipes found on your site and not one has failed me. The recipes are easy to follow and filled with flavor. You are my “go to” when I’m planning a meal. Thank you! Thanks for your message, Jolene :). I found the Vegenaise in the refrigerated section of my WF, next to the tofu and tempeh products. Otherwise, just use the best mayo you can find. Enjoy! After your Tex-Mex class the other day, I gave Vegenaise a try. Just used it to make egg salad for lunch. I’m a convert! I wish I could make a good homemade mayo, but I’ve given up. Problem is that I don’t love the ingredients in commercially prepared mayonnaises. This is the best out there for me. Glad you liked it! 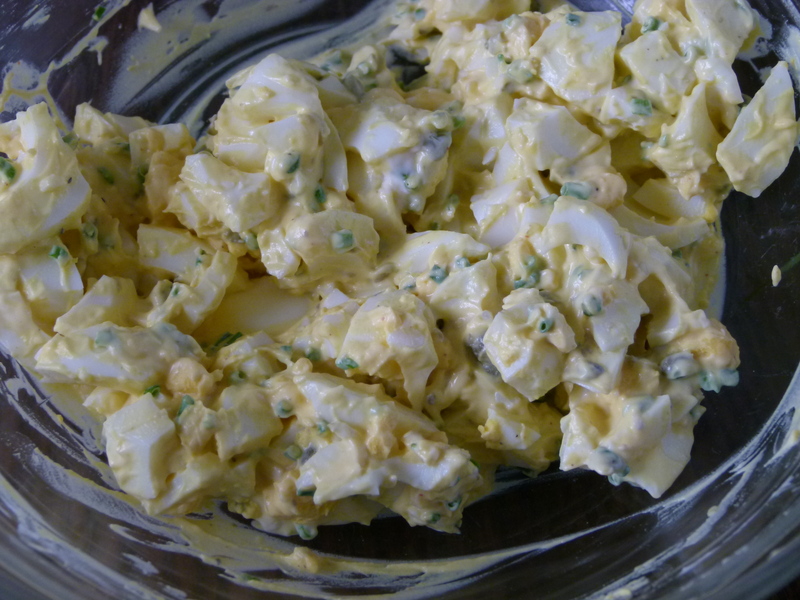 I made you egg salad tonight- delicious! I actually combine your recipe and your Mom’s recipe. Sometimes I add chopped boiled shrimp or smoked salmon for a nice brunch dish. Pamela- Happy Easter! My daughter, Marie, made your kale salad recipie to be served with roasted lamb. I’m a convert-it was fresh, crunchy and delicious. I have always cooked my kale but this salad will be a nice alternate to mixed spring greens or dandelion salad. Thank you. Thanks for all the great recipes. When I make hard boiled eggs, I sometimes separate the yolks and the whites. Yolks dissolve beautifully in both oil- and water-based liquids, so I use them to enrich soups, sauces and even salad dressings. And instead of deviled eggs, I’ll stuff the whites with non-egg fillings like tapenade or diced roasted veggies. Thanks for sharing your great tips, Miriam. 🙂 Love the idea of using tapenade to fill the egg cups!